Newland Communities, the country’s most prominent privately held residential developer, prepared to launch its newest master-planned community, Wendell Falls, on May 16, 2015. Wendell Falls is situated in a relatively undeveloped section of Wake County with the perception of being far away from other towns in the county. Newland Communities turned to Clairemont Communications to position the community as a popular living destination and craft a successful grand opening event that would generate buyer traffic and dispel the myth that Wendell Falls was a distantly located neighborhood. Clairemont crafted a grand opening event strategy that targeted home buyers who valued a sense of community. Clairemont highlighted the fun, relational atmosphere at Wendell Falls and provided opportunities for potential guests to personally interact with the brand. Clairemont and the Newland team modeled the grand opening after a classic barn raising, an event designed to highlight the community’s innovative offerings while honoring its urbane way of life, agrarian heritage and strong sense of community. Clairemont created a barn raising atmosphere through entertainment reminiscent of a family carnival. Guests enjoyed southern fare, pony rides and rickshaw tours while being serenading by two top bluegrass bands. Attendees could document the event at a fun photo booth and then sign an old-fashioned commemorative barn quilt. The Barn Raising culminated with the announcement of the winner of the “$50k on the House” – a contest that invited homebuyers a chance to win $50,000 toward a new house in Wendell Falls by writing a short entry and taking selfies at the model homes prior to grand opening. 11 news stories within one month of opening, including a Sunday paper front page spread and two television segments. Five bloggers and approximately 250 community influencers visited Wendell Falls prior to its grand opening. Clairemont and Wendell Falls hosted 2,000 attendees at the grand opening, a 100-percent increase above the original goal. 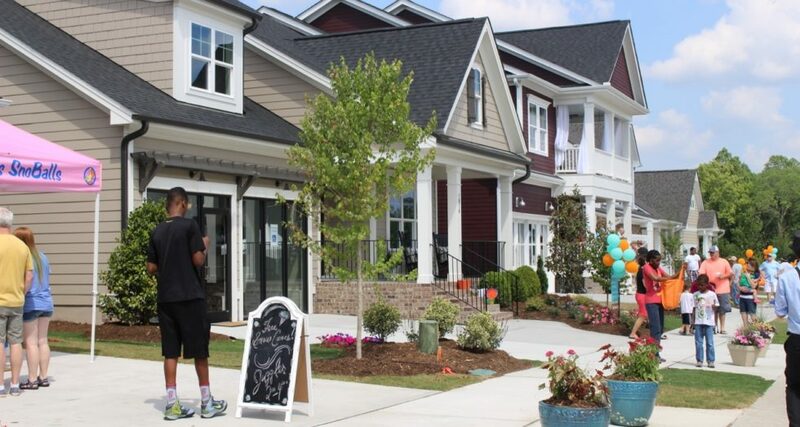 Clairemont successfully positioned Wendell Falls as one of the top places to live in Wake County, efforts that have helped Wendell Falls meet its annual sales goal and earn the community the title as Best Master Planned Community in East Wake County by The News & Observer. The work Clairemont Communications conducted in partnership with Wendell Falls earned a Gold Excellence Award for Total Campaign from the Raleigh Public Relations Society as well as Best in Category for Events & Observances from the North Carolina Public Relations Society of America. We are proud that this campaign represents two of the 137 awards we’ve received since starting Clairemont in 2010. To read more about the work we do with clients, please visit the case study section of our blog.